The demand for qualified Solar Technicians is rising, as more consumers and businesses apply solar energy in their communities. Many employers are requesting NABCEP (North American Board of Certified Energy Practitioners) certification or equivalent skills as a condition of employment. Amatrol’s Solar Thermal Installation Learning System supports the learning necessary to prepare for portions of NABCEP certification and helps to prepare students for successful employment in the solar thermal industry field. The 950-STF1 Solar Thermal Installation Learning System teaches students the installation and commissioning of closed loop and open loop solar thermal systems for commercial and residential applications. 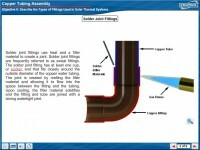 Students will learn how to install systems by selecting, preparing, mounting and connecting solar thermal components using copper tubing, PVC piping, and electrical wiring. Students will create and commission complete working systems, just as they would do on the job. The 950-STF1 includes a mobile workstation with solar thermal components; solar thermal collectors; PC-based interactive, multimedia student curriculum; and teacher’s guide. The mobile workstation is equipped with shadow boards for component storage, a benchtop worksurface and vise for tubing preparation, and mounting surface for assembly of solar thermal systems. Installation Skills Practice – The 950-STF1 provides a platform where students install real world systems using components commonly found in commercial and residential environments. Students select materials, solder and cut copper tubing, cut and glue PVC pipe, and run wire to assemble working systems, just as they would do on the job. These skills are part of the preparation process for getting NABCEP certification. 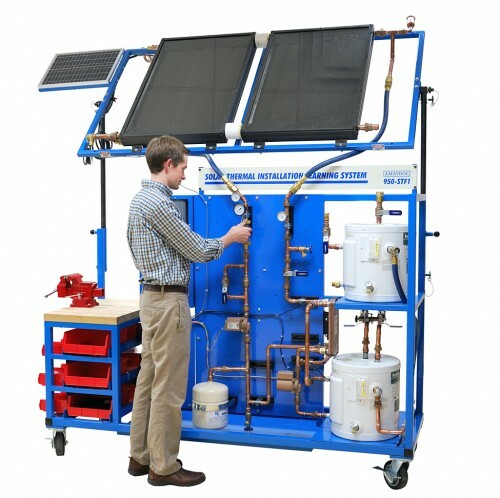 Multi System Capabilities – This system has the unique ability to allow students to specialize in one of or four different applications of solar thermal installation. The base model of this system is designed to teach installation and commissioning of closed loop pressurized solar thermal systems. Option models 95-STF2 and 95-STF3 expand the learning to teach three more systems, including: closed-loop drainback, open-loop auto-draindown, and open-loop manual draindown. Efficient, Effective, and Safe Training – This 950-STF1 workstation has been designed to be an effective, self-contained, and durable learning device. Installation skills are performed quickly and all-inclusive at the workstation with the use of bench-top workspace, table vise, and system installation panel. Silk screened shadow boards provide inventorying for easy access and storage. Soldered components are supplied with unions and some preassembled piping to enable them to be reused by multiple student classes and minimize consumable costs. The 950-STF1 has been designed with safety in mind to give students a safe experience and teach key safety skills. Safety features include: a soldering curtain that can be used in tight spaces to prevent fire; emergency stop pushbutton; automatic shutoff system to prevent overheating of collectors, and lockout/tagout.